Poor, unfashionable mung beans… While a number of ingredients have crossed the aisle from “health food” to mainstream (hummus, tofu), or even become trendy (quinoa, chia seeds), mung beans are not among them. There is still something 1970s, socks-and-sandals, “knit your own yogurt” about mung beans (at least in their un-sprouted form). Or maybe it’s a name thing… if you were brainstorming names to market a new legume, I doubt “mung” would make the long list. Having been a friend of the mung bean for years, I’d like to introduce them to a wider social circle. This mung bean coconut curry is a good place to start. 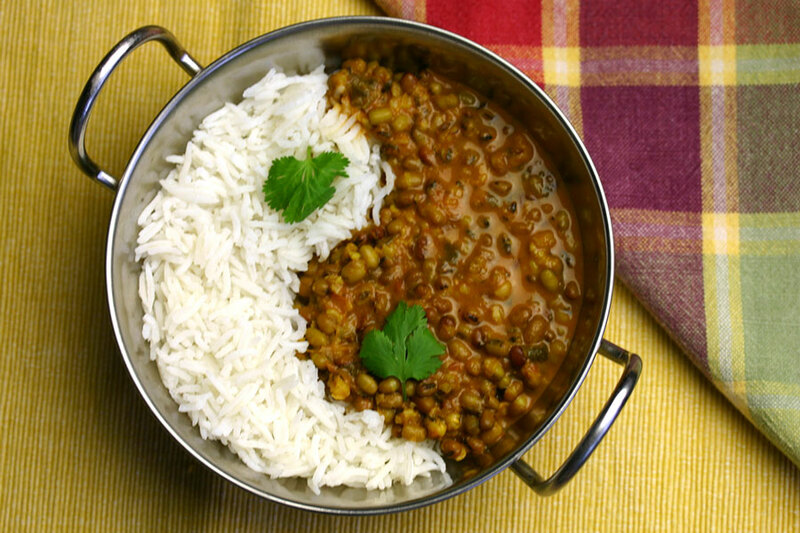 Quick to make (mung beans don’t need pre-soaking), delicious, healthy and cheap, this curry is a winner. The recipe is based on one from the Vij’s at Home cookbook. Heat the oil in a heavy saucepan over a medium flame. Add the cumin seeds, and cook until they start to colour. Add the garlic and ginger, and cook a few minutes more. Stir in the tomatoes, then add the coriander, turmeric, chilli powder and salt. Cook for five minutes, stirring frequently. Add the mung beans and water. Bring to a boil, then cover and turn the heat to low. Cook for thirty minutes, stirring occasionally, until the beans are just tender. Stir in the coconut milk then increase the heat to bring the mixture just to the boil. Remove from the heat, and stir in the lime juice to taste, and the chopped coriander. Adjust the seasoning and serve with basmati rice. Wow!! this looks so appetising.I love mung beans.They are so tasty and healthy too. Thank you, Anurahha – I love them too. Aside from tasting great, I enjoy their texture as well. Very true.I love the texture too. Mung beans are my new favourites (oh and they look so cute too!). Your photo also looks delicious! Thanks, and glad to find another mung bean appreciator! As one of the biggest curry fans ever, I’m definitely going to try this!!!! Being gluten free, I have tried mung bean flour before. My precooked, cookie dough didn’t taste very good. Luckily the cookies turned out fine. Bean based flours are never leave the dough tasting good. Still, I imagine mung beans are amazing in a curry! It took much longer to cook than listed. Flavours were good. I cook a lot of Indian food and this is textbook. I’ve not cooked with mungs, but I’ll definitely give this a try. Do you have Vij’s cookbook? Thank you. I don’t have any of his cookbooks as yet, but planning to visit the Cambie Street restaurant when I’m back home this summer. Is there a particular cookbook you’d recommend? We loved it! Definetely doing it again….